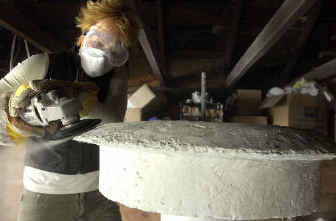 The fountain multi-media artist Rachel Dolezal is crafting in her Coeur d’Alene garage will be designed to inspire. Figures at the base of a tall column will be troubled, sad, and searching for answers. But as the viewer’s eyes travel up the column, the painted mural will show people dancing, celebrating and reaching for their dreams. A clear sheet of water will flow down around the center column, and a steel rim bench will encircle it. A globe will perch atop the 500-pound fountain. Called “Triumph of the Human Spirit,” the fountain will attempt to inspire people on more than a personal level. It is the “teaser” fountain for a new public art fund-raising effort. It’s a sequel to last summer’s “No Moose Left Behind” project, which raised money for the EXCEL Foundation. The new community art project, however, aims to benefit dozens of nonprofit organizations. Dolezal’s fountain will be placed on the northeast corner of Third and Sherman by mid-June. At the end of summer it will be auctioned, with most of the proceeds benefiting the Human Rights Education Institute. This is how it works: Nonprofits interested in participating find sponsors to donate $6,000 for a fountain. Dolezal’s fountain, for example, has been sponsored by North Idaho Title, Empire Airlines, Shelter Associates, International Minute Press, Margaret Reed Foundation, the Human Rights Task Force and Pita Pit USA. The $6,000 pays both a stipend to the artist and the administrative costs of running the benefit, Moreland said. Nonprofit organizations are paired with artists, who submit designs for consideration. Up to 30 fountains will be commissioned by September. Artists will build the fountains through the winter and spring, and they will be placed on downtown street corners by summer 2006. Moreland said she submitted a request to the city to use the street corners. At the end of the summer the fountains will be auctioned off, with the net proceeds benefiting the nonprofits. The beneficiary organizations can have multiple fountains if they can find sponsors to foot the bill. In addition, at least 10 tabletop fountains will be commissioned for placement in downtown restaurants. The sponsorship price for the smaller fountains will be $2,000. Moreland said she hopes the fountains raise as much money as was earned when the painted moose sculptures were auctioned last September. They brought in an average of $13,000 apiece, Moreland said. Any coins thrown into the fountains by passers-by will be considered a donation to the beneficiary organizations, which will remove and keep the money. Moreland said numerous nonprofits already have expressed interest in participating. They include United Way, Big Brothers and Big Sisters, Hospice of North Idaho and The Women’s Center. “I am overwhelmed with the energy circling around this,” Moreland said.